The heat coming off these babies could cook an egg. Nvidia is one of the two leading GPU-makers (graphics processing units) in the industry and they sure haven't been idle these past few years in their battle with rival AMD. Along with continuing to produce high-quality graphics cards, Nvidia has quietly been working in their skunkworks on how to further ingratiate themselves in the gaming community. Today at the Consumer Electronics Show in Las Vegas they already announced a handheld gaming device called "Project SHIELD" - Avengers reference notwithstanding - but Nvidia is also dipping its toes into the so-called cloud-gaming space. They've created a massive tower of silicon and plastic that can stream extremely high-quality gameplay directly to your PC or tablet without you having to own an expensive rig yourself. The tech is called the Grid, and the massive rack has 240 Nvidia GPUs connected together. That's the equivalent of 700 Xboxes, according to the presentation at CES. The demonstration showed one guy playing Trine 2 on a huge TV, then pausing the game and booting it up on an ASUS Transformer Prime tablet using the Nvidia Grid app, picking up exactly where he left off. The promise of seamless streaming syncing up your progress on a game is pretty exciting. Nvidia said they've been working on the Grid for five years, but other than the announcement, the company provided very few details. How much will the Grid service cost? Will games be separately purchased or will you be able to subscribe to a library like Netflix? 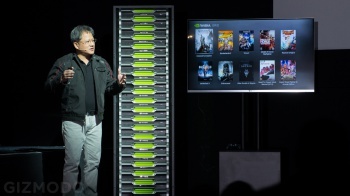 Depending on the answers to these questions, Nvidia might be able to compete with Onlive and Gaikai. And by compete, I mean blow them out of the water.